The advantage of this approach is a true end to end service in the Telecommunication space that allows us complete control over everything from design, deployment to HSE. As the managing director/owner of ART, I personally know everyone of our growing workforce and the word ZERO HARM has more meaning to me than just the legal implications, its personal. This means when you engage ART for a project, every person that turns up to you site been employed by me, not some person in the HR department and as the nature of our game is HIGH RISK, I am careful who I employ. The biggest difference between our work and many other industries is that our job is ALWAYS high risk….everyday. HIGH RISK work is our bread and butter, if you fall from a tower, there is no injury, it is final and our guys are VERY aware of this and therefore very carefully selected. They are than trained in every aspect of what we do, the design, the deployment, the civil, the installation and the hand over, which means you have people that intimately understand risk on a personal level in all parts of the project. To back that up, it is worth knowing that we are not some group of people that decided to have a go at tower work, our family has been building guyed masts and free standing towers since 1973, providing design, manufacture, supply and installation services for a wide range of products right from the beginning. We have extensive experience in the radio tower and high access rigging industry throughout Australia and internationally. We are located in NSW and Vic and have strategic depots throughout the country allowing us to service every state of Australia. We have dedicated divisions for mast and tower structures, communication systems and wind and solar monitoring systems. We hope you find this site and any interactions with ART insightful, satisfying and useful. ART is a company that exists and grows through the heart of its management and staff. We are dedicated to providing an enjoyable environment that supports and enhances all of ART’s employees. We believe this is the single most important factor in providing a long term and successful service to all those who deal with ART. ART is a family owned business that dates back to 1973 when we first entered the radio tower industry. Since then we have worked on masts from every manufacturer in Australia and have installed well over 4000 guyed and free standing masts and towers. 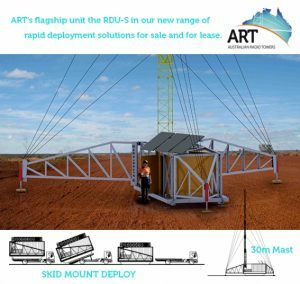 We consider our family and this business to be one of the pioneers in the Australian radio tower industry. In our early years we were based in South Australia and later spent nearly 15 years in the Northern Territory, a region that we consider to be one of the harshest in Australia. During that time we learnt the true meaning of innovation, remote location and how to work in the most difficult environments imaginable. We have professionally carried out work in all types of remote and inaccessible regions. We have extensive experience working with winches, cranes, gin poles, excavators, concrete plants, 4WDs, helicopters, planes, boats and barges. In 1976 we also became involved in the alternative energy, technology research and development sector and have worked with most major wind farm development companies in Australia. Due to the specialised and often unique project specifications, we have forged links with other industry professionals, manufacturers and suppliers to provide effective solutions to meet project objectives. This commitment to a philosophy of joint cooperation allows us to merge the speed, flexibility and innovation of a smaller operation with the strength and expertise of larger corporations. We are committed to the highest quality workmanship and workplace safety. All field staff are experienced and trained in first aid, safety and rescue practices and are familiar with OH&S procedures. We have carried out projects for Government, Military, public and private utilities in all Australian states, Indonesia, Papua New Guinea, Solomon Islands and Vanuatu. We have undertaken design and installation of alternative energy systems for use in Indonesia and remote northern Australian communities. We continue to design, supervise and implement the installation of communication and wind monitoring masts and towers for many national and international service providers operating throughout Australia. We pride ourselves on being at the forefront of delivering flexibility and innovation, in our opinion the most important aspects of service-based business. We will continue to focus on and develop these practices. We are committed to providing high quality service in the area of consultation, construction, inspection reporting, contract preparation, supervision and fabrication within the alternative energy and communication industries. As specialists in the area of guyed masts, wind monitoring systems, communications and high access rigging, we endeavor to remain unsurpassed.